Spring has arrived and, chances are, you’ve already scheduled your kids’ camps and planned summer vacations. What else is going to happen along with the sunshine and fun? If youth braces are on tap for your tween or teen, summer is a great time to begin the journey. No school, no homework, no extracurricular activities. Summer days are freer, and with fewer obligations that means there is less interference when it comes to scheduling orthodontic appointments. The first few visits to your Center City orthodontist when your child’s braces are fitted and adjusted will be longer, and more visits may be necessary to get everything working properly. Routine, shorter check-ups will begin after that, requiring less of a time commitment once school is back in session. Get past the awkward phase. Braces are an adjustment. Many kids appreciate being able to privately deal with the discomfort and tenderness that comes after that first appointment. Getting used to eating with braces, cleaning them, and feeling confident with this major change will take time and patience. 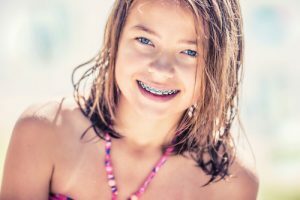 A summer installation means, come fall, your child will simply be a kid with braces and not a kid who’s getting used to braces – the difference is massive for this age group. Make friends with new foods. One of the biggest complaints young braces-wearers have are food restrictions. Patients who are eligible for Invisalign Teen don’t have to worry about this because the aligners are removable for meals. Wearers of conventional youth braces, however, will be given a clear set of rules about what foods are a danger to their hardware and teeth – nothing too chewy, crunchy, or potentially damaging to the braces. Over the summer, your teen will have plenty of time to get used to the idea of what foods are allowed and what’s not, find substitutes for their favorite foods, and figure out what braces-friendly foods will eventually work for school lunches. On the plus side, summer offers plenty of opportunities to enjoy soft, cold treats like ice cream and snow cones. They’re gentle on braces and a tender mouth. Brushing your teeth takes on a whole new meaning when there are braces to clean, too. Two minutes of brushing and flossing is no longer enough. Special tools are needed to get in between the hardware to make sure teeth are still clean and healthy underneath and food doesn’t get stuck where it shouldn’t. Taking time to establish a good braces- and teeth-cleaning habit in the summer will allow your child to move smoothly into the fall when school and a new routine starts again. Get braces at the right time for your child and your family. Summer is a great time to venture into orthodontics but any time of year is a good time of year to get braces. There is a schedule that is right for every family. Not sure if your child needs youth braces? Ready to get the braces adventure started? Visit orthodontists and certified Invisalign providers Dr. Roberts and Dr. de Marsche in Center City. Make an appointment today.